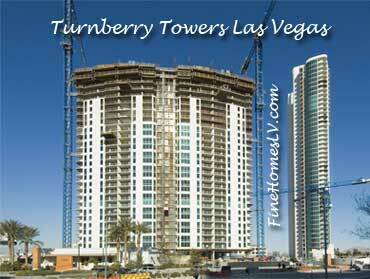 Turnberry Towers Las Vegas condos location is a block from the Strip. This attracts prospective Las Vegas condominium buyers who want to live within walking distance from the enterainment capital. The Las Vegas high-rise luxury development, currently under construction at the corner of Karen Avenue and Paradise Road, is across the street from Las Vegas real estate developer first Las Vegas Valley project, Turnberry Place Las Vegas. Turnberry Place was one of the first Las Vegas high rise condo resorts in town and located across the street from the Hilton Las Vegas. 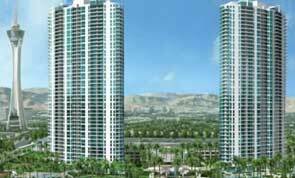 Turnberry condos Las Vegas real estate development features two 45-story towers with amenities such as an outdoor pool with sundeck, fitness facility, tennis courts and landscaping. Sales for the west Turnberry Tower Las Vegas condos are being conducted quickly and the east Turnberry Tower sold out in a little under three months.